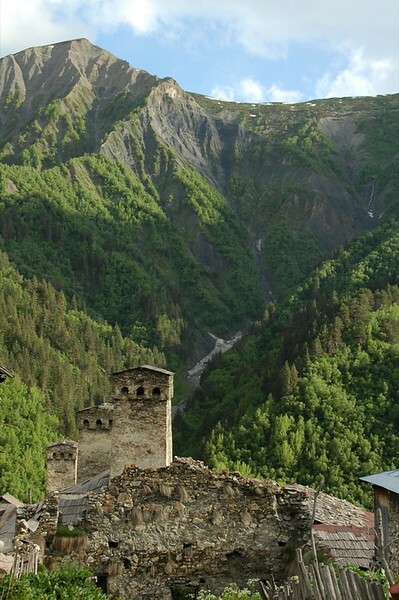 Svaneti trekking and travel highlights. 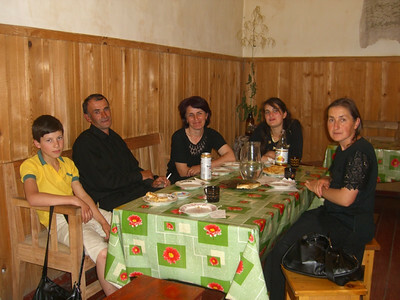 Zugdidi to Mestia by jeep and hiking and home stays from Mulahi to Ushguli. 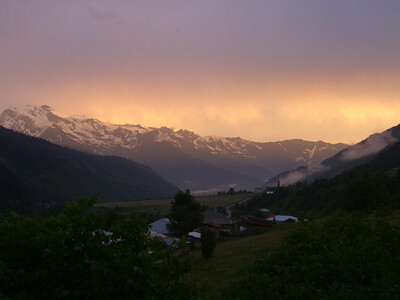 Svan people, Svaneti mountain landscapes, supras and tamadas feature prominently. Read about our visit to Svaneti and the rest of our visit to Georgia. A sampling of the other passengers crammed into the jeep with us from Zugdidi to Mestia. The women were more than a bit wary of us at first. But by the end of the trip, they offered us food, kisses, and even lip gloss (for Audrey, of course). Read about our visit to Svaneti and the rest of our visit to Georgia. 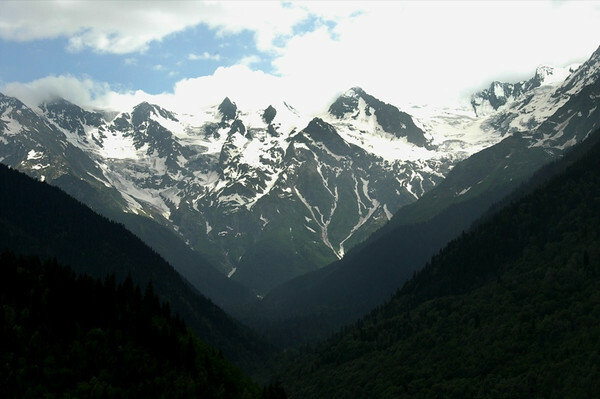 A quick shot off the pass from Mulahi to Adishi (en route to Ushguli from Mestia). 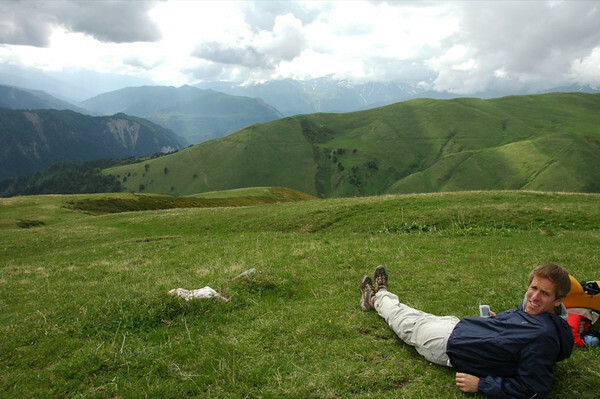 This is why Georgians go "ush, ush, ush" when you tell them that you are headed to Svaneti. 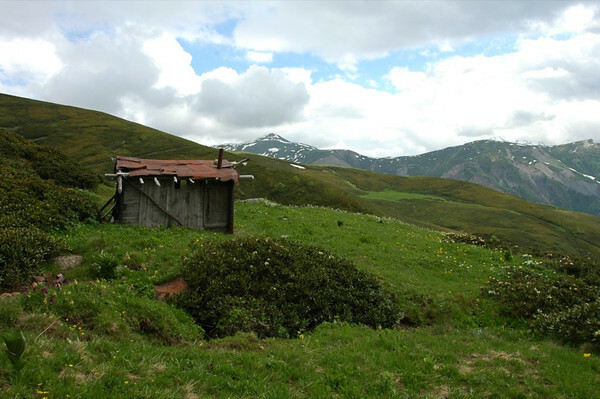 The Svanetian landscapes are only outdone by the people and their hospitality. 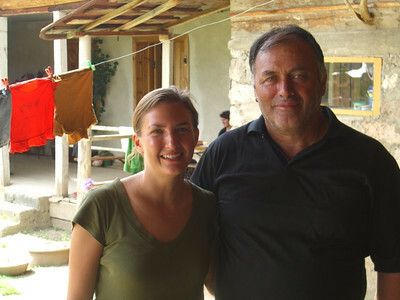 Read about our visit to Svaneti and the rest of our visit to Georgia. 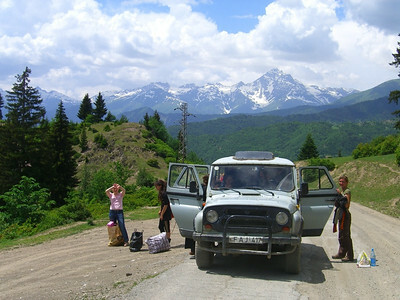 A passenger drop off at a small village in Svaneti. Just a taste of the region's dramatic landscape on the approach to Mestia. Read about our visit to Svaneti and the rest of our visit to Georgia. 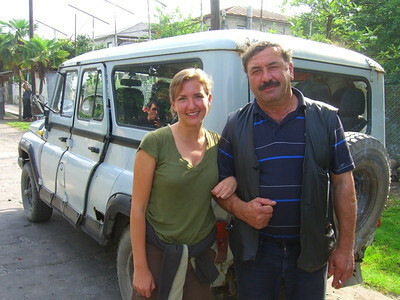 Our driver from Zugdidi to Mestia was a jolly guy, happy to have his photo taken with Audrey from time to time. This old Russian jeep was filled with 10 people, their luggage, huge sacks of sugar and singing dolls...all for a fascinating, 7.5 hour-long journey. Read about our visit to Svaneti and the rest of our visit to Georgia. 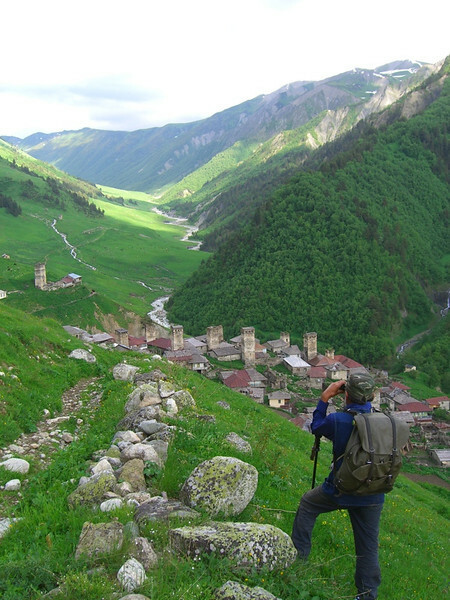 The village of Adishi in Svaneti splits the mountains en route to Ushguli. We spent a night with a local family here. Read about our visit to Svaneti and the rest of our visit to Georgia. Svan towers mark the entrance to the village of Adishi, the mountain village where we slept the first night of our hike. Read about our visit to Svaneti and the rest of our visit to Georgia. Read about our visit to Svaneti and the rest of our visit to Georgia. 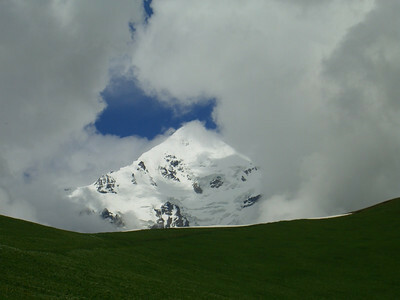 A peak emerged from the top of the pass from Adishi to Iprari. Read about our visit to Svaneti and the rest of our visit to Georgia. Khachapuri stop #2 from Zugdidi to Mestia. Audrey was rather popular with the Svan men. Read about our visit to Svaneti and the rest of our visit to Georgia. 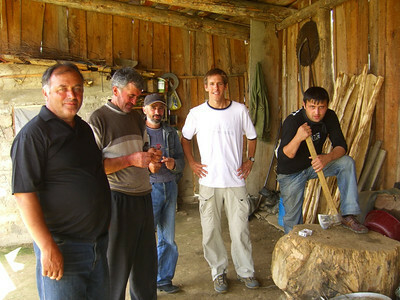 We're invited into a barn for "Svaneti wine" at the home of one of our fellow passengers. No shortage of khachapuri (gooey cheese and leek-stuffed bread) to accompany dramatic toasts with fresh berry wine...to family, friends, ancestors, the mountains, etc., etc. Read about our visit to Svaneti and the rest of our visit to Georgia. The clouds lifted long enough to afford us this beautiful view during the opening party for the Svaneti Tourism Center in Mestia. Read about our visit to Svaneti and the rest of our visit to Georgia. 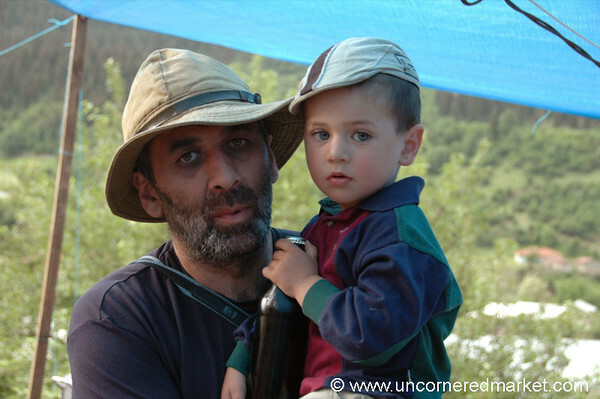 Zaur and his son share similar eyes and a love for hats. Read about our visit to Svaneti and the rest of our visit to Georgia. 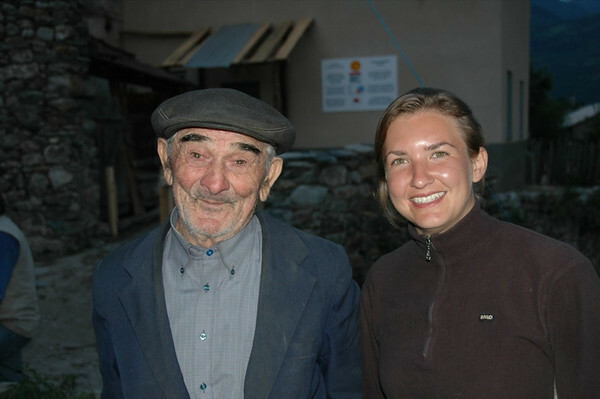 Have we already told you that Audrey was quite popular among the men in Svaneti? Read about our visit to Svaneti and the rest of our visit to Georgia. 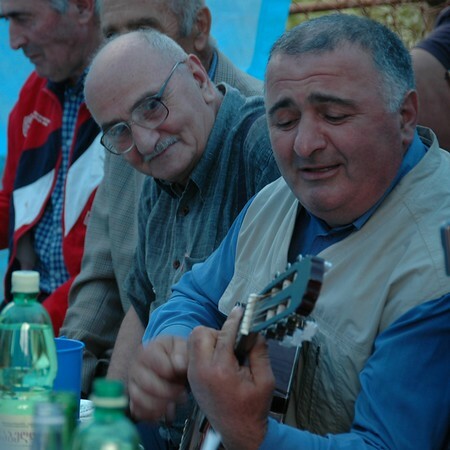 We were treated to many Georgian and Svanetian folk songs during the inaugural party for the Svaneti Tourism Center in Mestia. Read about our visit to Svaneti and the rest of our visit to Georgia. 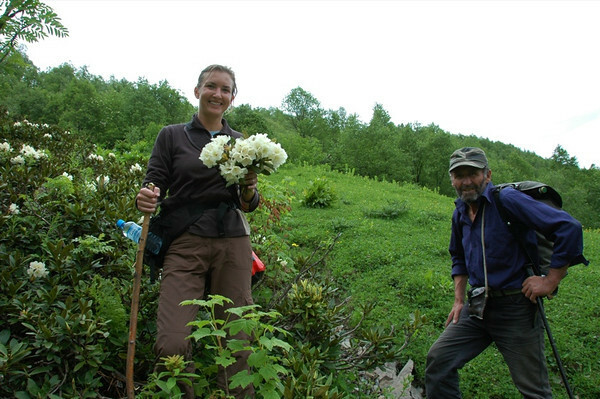 Avgan prepares a bouquet of flowers for Audrey from wild rhododendron. A pretty bunch of flowers, but not so practical when hiking over mountains. Read about our visit to Svaneti and the rest of our visit to Georgia. 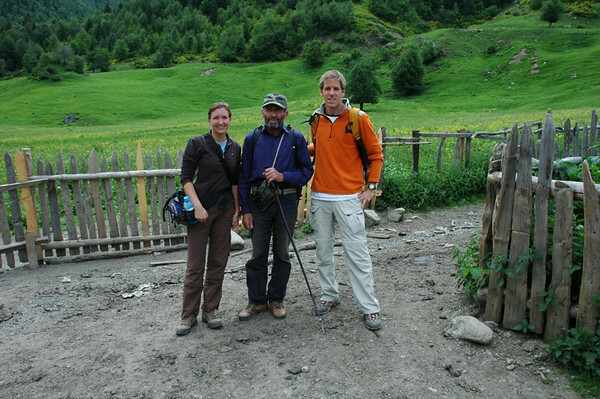 Audrey, Avgan (pronounced much like Afghan) and Dan start on their three-day, 35 mile hike from Mulahi to Ushguli. Avgan found us the trail with the best views, the most wildflowers...and the most cowpies. Read about our visit to Svaneti and the rest of our visit to Georgia. Mobile phone connectivity in Svaneti is pretty amazing. We were able to get signals through most of the journey. Go Magti (our Georgian mobile phone provider)! Read about our visit to Svaneti and the rest of our visit to Georgia. When it's too far to take the cows home each night... Read about our visit to Svaneti and the rest of our visit to Georgia. A picnic lunch on the first day of our hike yielded warm leek and cheese-filled khachapuri and trays of vegetables. Read about our visit to Svaneti and the rest of our visit to Georgia. 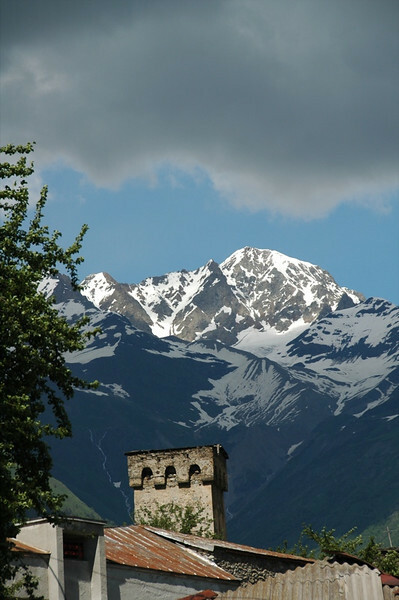 Villages in Svaneti are dotted with these trademark towers. 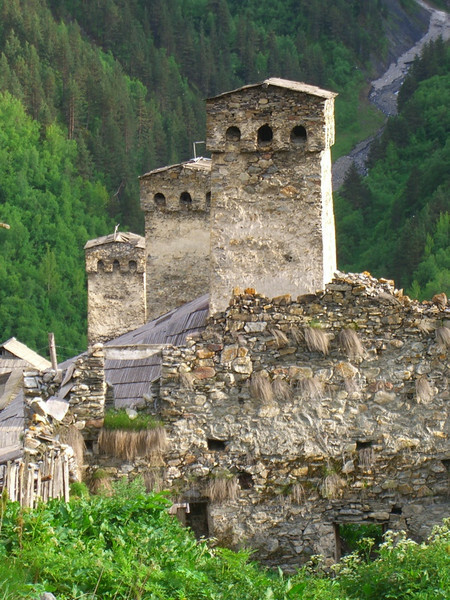 Used originally for defense, many of these towers date back to the 12th century. Read about our visit to Svaneti and the rest of our visit to Georgia.